Researchers from the University of Portsmouth say their early findings may go towards explaining why some people struggle to stay slim. Experts already know that part of the brain that processes information about odour is also connected to the feeding centres of the brain. 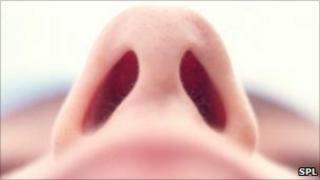 The latest research is published in the journal Chemical Senses. In the UK, a quarter of adults are obese and doctors fear that the incidence will only rise in the future as more and more people continue to pile on excess weight. While too much food and too little exercise may be largely to blame, scientists have been searching for the underlying causes driving the obesity epidemic. To this end, Dr Lorenzo Stafford and his team set out to study if a skewed sense of smell could be partly to blame. His team asked 64 volunteers to take part in a series of experiments that tested their smelling ability. Their study found that people appear to be slightly better at smelling food odours after they have eaten rather than when they are hungry. Scientists do not yet know why this is, but Dr Stafford suspects that it could be the body's way of detecting and rejecting foods no longer needed in order to maintain the right energy balance and stop a person eating too much. His team found that people who are overweight - those with a higher body mass index or BMI - have a far heightened sense of smell for food compared to slim people, particularly after they have eaten a full meal. "Hopefully this research will stimulate more work in this area with the potential to help those who struggle with their weight and those who treat people with weight problems."